I'm trying to set up a simple network of my basins and outfalls. My end goal is to see what the basins are putting out for flow for different storm events. In one instance I have three basins flowing to the same outfall. I can't get CivilStorm to combine the hydrogrpahs and tell me the overall peak flow for those three basins combined. I'm using the SCS CN / unit hydrograph method. I just want something simple-- can I create a "dummy" node to attach these catchments to and get a combined flow? I've tried "outfall", "ponds", and even other "catchments" with no success so far. I want a purely hydrological model, no storm sewers involved. I would suggest placing a "dummy" cross section node with a channel going to an outfall. 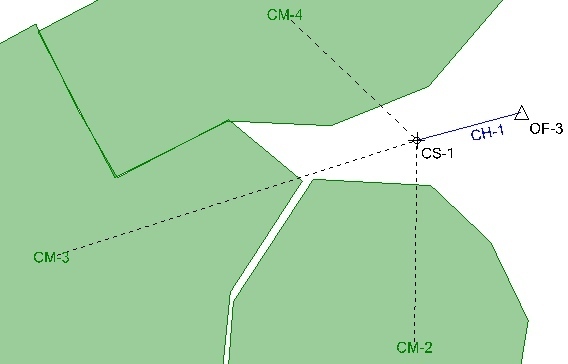 Set the cross section invert to give a slight slope to the channel, and use a short channel length such as 10 feet. 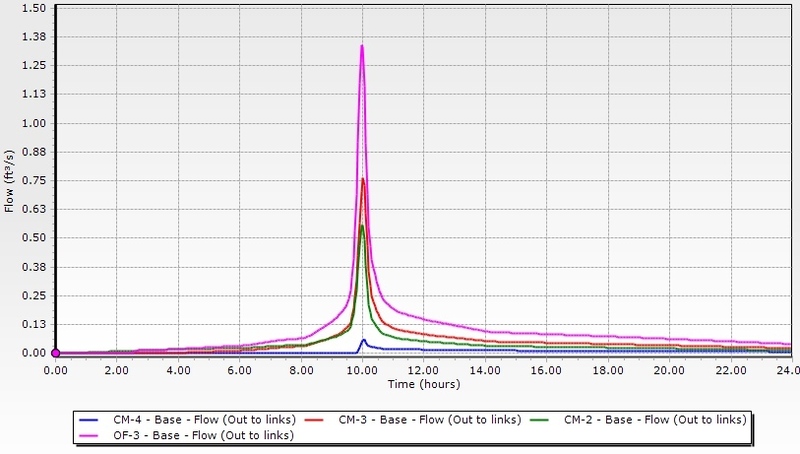 You can then graph "Flow (Out to Links)" for the outfall node to see the combined hydrograph. 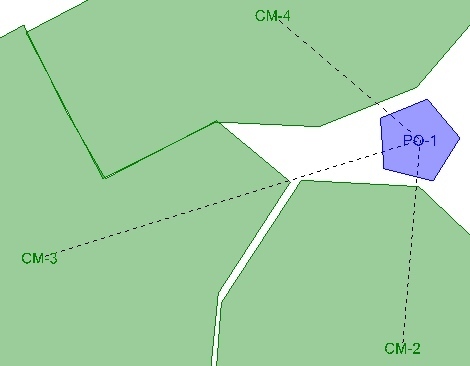 You could also place a "dummy" pond with some made-up elevation-area curve, then graph "Flow (Total In)" for the pond. In either case, ensure that the "Outflow Element" attribute for each catchment is set to the appropriate element, to direct the runoff hydrograph. Thanks-- the dummy cross-section method looks to be the best since you can see all of the flows. Actually the dummy pond was much easier. I just set it for an infinite basin really. Any problem with setting elevation 0, area 999 ac and elevation 999 and area 999 for the elevation-area curve? This was closer to the flow from the basins than the cross-section method but still off generally by +/- 0.11 cfs or so...any reason for this? (I tried a dry run of 1 catchment and one pond. 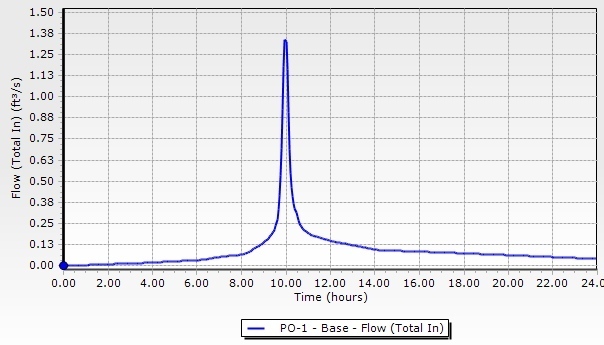 The catchment generated a peak flow of 140.55 cfs but the pond flow (total in max.) is 140.44 cfs...any reason for this? Some reviewers care about cfs down to the hundredths place and I would like to be providing accurate results. For a single catchment, you can simply click Analysis > Compute Hydrology, then graph "Flow (Out to Links)". Though, you would need at least one other outfall somewhere in the network to do this. The configuration of the "dummy" pond should not matter, as it would not effect the inflow result. 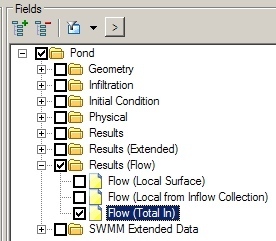 The reason why you see a slight difference in the catchment vs. pond flow results might be due to your timestep setting. This is located under Analysis > Calculation Options. The catchment calculation uses a Hydrologic Timestep, the other calculations use the Calculation Timestep, and the results are reported at the Output Increment. Try setting these three time steps to the same value (such as 0.01 hours) and see if that helps. If not, you could consider contacting technical support. That fixed it. The output increment was different and once I made it the same as hydrologic and calculation everything fell into place.